We promote the conservation, preservation, and restoration of the native plants and native plant communities of Broward County, Florida. We are the same. The eNews has a new look. The former eNews online-editor was very difficult to use. "Quirky" is the polite way to describe it. So over the summer we made the switch to a different free service. So far, so good. Among other things, eNews now displays well on smartphones and tablets. Even modest conservation efforts by our members and friends can make a difference. When you send us an email, we read it and respond. We work on a variety of fronts, but need people looking to accomplish something for Broward plants or Chapter services. If you don't have time, $35 is an important contribution (and you don't ever have to attend anything). We know you care. Let us know if we can facilitate. We are part of the statewide Florida Native Plant Society, a united effort to conserve, preserve, and restore Florida's natural plant legacy. Visit the Broward Chapter and the Florida Native Plant Society (see Online Resources above) for extensive local and statewide native plant information. Perhaps you have noticed that south Florida has native ferns, lots of them. 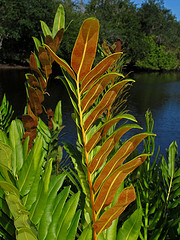 The largest North American fern, Giant Leather Fern, Acrostichum danaeifolium, (left: Alan Cressler) is a common sight with its ten-foot-plus fronds clumped on a river bank or in the Secret Woods. 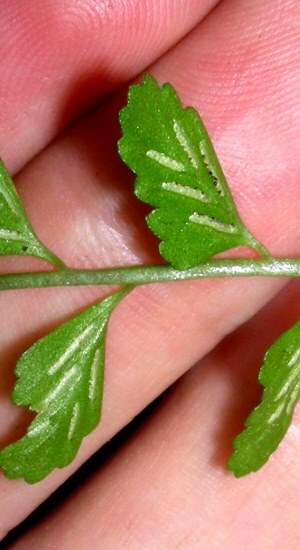 The leaflets (pinnae) of the similar, but more rare Golden Leather Fern, Acrostichum aureum, are more widely spaced. A tiny fern is Toothed Spleenwort, Asplenium dentatum, (right: Jennifer Possley) with fronds just a few inches long, but the tiny prize probably goes to the Carolina Mosquito Fern, Azolla carolinians, (below: Alan Cressler) another Broward native that floats here with a few leaves of Duckweed. The photo in this month's eNews header is Cutleaf Spleenwort, Asplenium abscissum, a species that shouts for us to care for our natural plant communities. The Institute for Regional Conservation account reads, "John J. Soar first collected cutleaf spleenwort in 1903 in a hammock near Homestead..., possibly at Hattie Bauer Hammock, Fuchs Hammock, or Meissner Hammock. In 1979, Grace Iverson collected cutleaf spleenwort in Broward County..., in what is now Fern Forest Nature Center. Bradley and Alan Cressler observed this population in 1996. Fewer than 10 plants were observed.... Major threats [are:] exotic pest plant invasions; off-target damage from exotic species control programs; poaching; long-term drainage of rockland hammock habitat in both Broward and Miami-Dade counties." 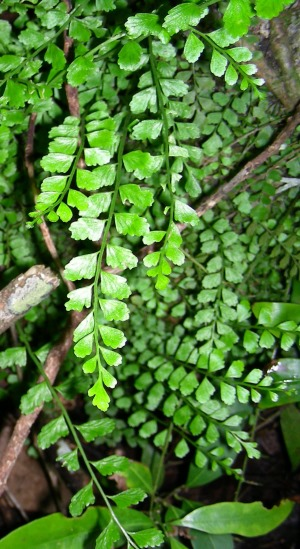 We estimate that Broward has about forty broadly-defined ferns with many more species in the surrounding counties. Very few growers supply native ferns, so they make a good plant to trade. You can also grow ferns from spores, but it may take a year. Mike Freedman and Jennifer Possley describe a simple method you can do at home. 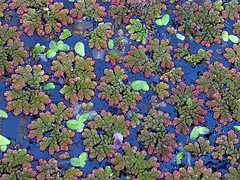 Read about it in the Fairchild Botanic Garden article, The Fern Renaissance. The final photo is another of the diminutive Toothed Spleenwort, Asplenium dentatum (shown on fingers above), but here (right: Jennifer Possley) at about life size. Later in the year we will invite Jennifer to speak to us and hopefully take us on a field trip to the Fern Forest to learn more about this wonderful south Florida fern legacy. Visit the Calendar at Coontie.org for next event details & updates. Plant Sale, Saturday, August 30, 9 am, Secret Woods parking lot, 2701 Florida (W. State Rd.) 84, Dania Beach, FL 33312. With local nurseries, the Broward Chapter sells native plants to the public. This is your best chance of finding many species that you have been unable locate. We make a special trip to a wholesale nursery south of Miami to find healthy, reliably-sourced plants not locally available. Other vendors have beautiful native plants, too. Our sales help support Chapter operations, so every purchase is also a donation to help conserve local native plants. This sale takes place at the Secret Woods parking lot in the morning. Sales continue rain or shine. Speaker: Lindsey Nieratka of the IRC, "The Institute for Regional Conservation and Habitat Restoration at Home", Wednesday, September 10 (always on 2nd Wednesdays), 7 pm, Secret Wood Nature Center, 2701 Florida (W. State Rd.) 84, Dania Beach, FL 33312. Lindsey is program administrator at the IRC coming from a variety of very interesting wildlife experiences (attend to hear). In 2003 she was a biologist at Jonathan Dickinson SP. She then received her Master's in Environmental Studies from FIU including conservation research in Oaxaca, Mexico. After graduating she taught Environmental Science, Global Environment and Society, and Ecology of South Florida at FIU. She joined the IRC in 2012. National Public Lands Day at the Secret Woods, Saturday, September 27, 9 am, Secret Wood Nature Center, 2701 Florida (W. State Rd.) 84, Dania Beach, FL 33312. The Broward Chapter pitches in on this day to improve the Secret Woods. The first place to start saving the world is at home. The Secret Woods is the home of our Chapter. This natural land in the heart of urban development needs our hands and hearts to thrive. As if doing the right thing for nature were not enough, we are also rewarded by free use of this facility to do our public education and plant conservation work. Please support this park and thank the staff of the Secret Woods for hosting us so graciously all year long. Make this your annual must-do event. Invite friends, family, and wildlife groups with a desire to support nature in urban Broward. Speaker events are on 2nd Wednesdays at 7 pm at the Secret Woods. so always check the Calendar for last minute trip updates. Copyright © 2014 Broward Chapter of the Florida Native Plant Society, All rights reserved.